Taxes on beer are set to increase by more than 160% under a controversial new law being pushed through the French parliament. The tax rise will add an estimated five euro cents (four pence; six US cents) to a half-litre glass of beer. President Francois Hollande's government said the policy would raise 480m euros to invest in social projects for young people and the elderly, and ministers say the move will help reduce alcohol and tobacco consumption. 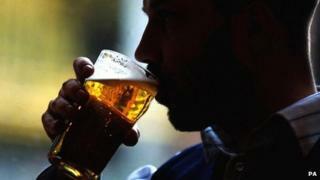 But trade groups have argued that the rise could damage the beer industry in France and affect breweries across Europe. At The Bowler, a British-themed pub in Paris, Richard Wilson, who works in the beer industry, is holding a business meeting with staff from a well-known international cider company. He is originally from the Wirral, in north-west England, but has lived in France for 20 years. "This news is a little bit catastrophic to be honest," he said. "The industry is already having problems. People are drinking at home more and the bar sector in France is diminishing quite considerably at the moment, so it's going to affect us quite badly I think." The Bowler's barman, Paul Plowman, said he believed that more bars and pubs could be forced to close if the new legislation was passed. "I was working in England when taxes went up there at the height of the recession and you were hearing something stupid like 50 pubs a week being shut," he said. "I do think this is a step towards something similar here." He has been in Paris for two months and says he finds it more expensive than many other European cities. "If the price of beer goes up even more, I think people will think twice about coming here for a mini-break." Jacqueline Larivin, spokeswoman for the French brewers' federation Brasseurs de France, disputes the government's estimates and warns that if the legislation goes through, the price of a beer will increase by about 20% in bars and supermarkets as businesses pass on the extra costs to customers. But Richard Yung, a Socialist senator, argues that the crucial thing is to reduce public debt by 30bn euros next year, and the beer tax is just a small part of this. "At the moment, taxes on beer are low in France compared with other countries so we thought, why not?" he said. "We have been careful to make sure it will be big beer factories that are affected, not small ones." Simon Spillane, a senior adviser for the Brewers of Europe organisation, says the added cost to a half-litre will be more like 30 euro cents, and comes at a tough time for brewers. "This is a real blow for the beer industry," he says. "Across the EU we have already seen beer production fall by 6% and consumption fall by 8% since the start of the economic crisis." Businesses in Belgium and Germany that trade with France are likely to be worst affected, he argues, as well as smaller family firms and microbreweries that focus on quality rather than quantity, though an amendment currently being discussed is aiming to exempt small independent breweries from the tax rise. There could also be an impact on British breweries that export across the English Channel. "Beer represents 10% of UK food and drink exports so it's clearly a key to economic recovery there," according to Mr Spillane. "British companies export 28 million pints of beer to France every year and we need to keep the industry alive." The number of Brits making the trip to Paris could also fall, he warns. "The booze-cruise phenomenon is already less popular than it used to be five or 10 years ago, but we can expect travellers who make the journey over the channel to find higher prices than there were in the past." Many French drinkers said they were resigned to the idea of higher prices. "It will just be a few euros here and there, you won't notice really, even if you drink too much!" said Lea Rouge, from Paris. "I still don't agree with the policy though, it is yet another regulation that we don't need." "I support the government asking people to contribute more," said Daniel Astrid, who was born in France but now lives in Canada. "But you know you just have to be sure about what they are going to spend it on. They may say it is to help people but then go and spend it on weapons and whatever else they want." The higher tax rate was agreed by France's National Assembly on Tuesday but it stills need final approval from the country's second chamber, the Senate, which is expected to vote on the policy soon. There is unlikely to be tough opposition, as it is made up of a majority of Socialist politicians who support President Hollande. So far there are no signs that the policy will be extended to the country's most beloved beverage - wine.